Today I had a dentist appointment during my lunch hour. Since I rode my bike in to work it was my mode of transportation to get to my appointment. I couldn't wait to get out into the fresh air again!! All the while I was pedaling there, there was a good breeze blowing in the darker clouds and I had hoped it wouldn't rain on me. Silly commuter, I thought. I chose to leave my coat at home today even though I knew the weather forecast indicated a good chance of rain. My route took me on Mill Street and I was very grateful for the bike lane. Mill Street once had four motor vehicle lanes in each direction. There was no on-street parking and no lanes until the road conversion took place. Now there are three lanes (one in each direction with a turning lane in the middle), on-street parking and bike lanes in each direction. So there is a lot of motor vehicles speeding up, slowing down, turning or changing lanes to go around other vehicles or a bicyclist. And since the drivers are focused on driving ;-) the pedestrians or bicyclists would be secondary on their radars--no wonder accidents happen. 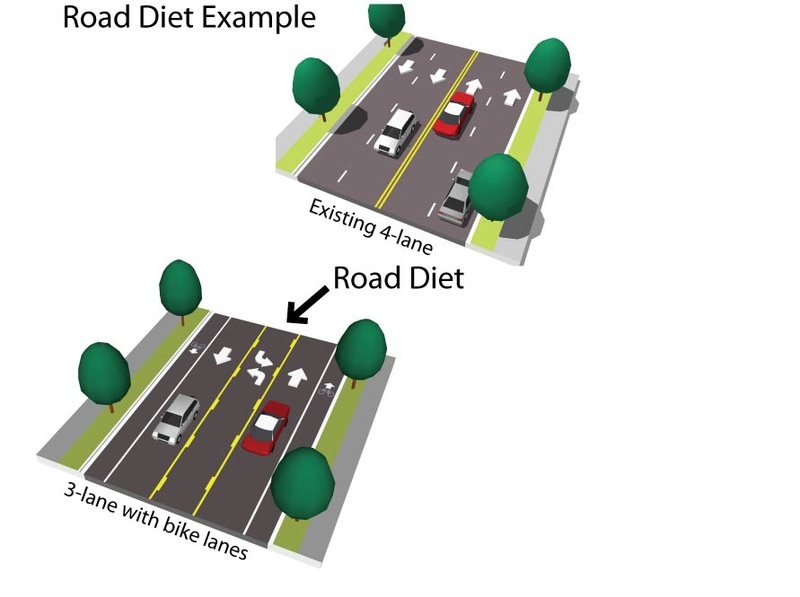 No doubt road diets make it safer for all users of the road. For pedestrians, it means crossing three lanes of traffic instead of four. At the end of the day, we all want to walk, drive or bike where we need to go safely right? I am grateful for road diets because it has allowed me to bike to the dentist's office during lunch! Without safe access, I would have needed to drive to work today so that I could get to the dentist's office and back.